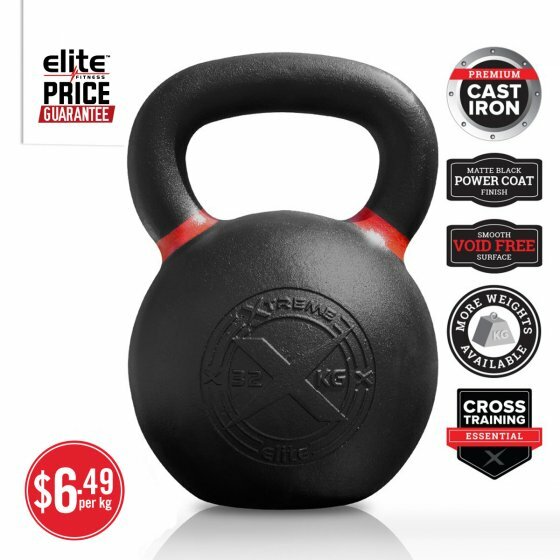 The Xtreme High-End Kettlebell has a matte black powder coat finish that has a great feel and will hold chalk. This feels more natural than a thick epoxy finish. We colour coded the handles. By associating each kettlebell weight increment with a different colour handle, it becomes much easier for gym owners and trainers to direct athletes to specific kettlebells on sight alone. Premium Material: We started with the highest quality first-run iron ore available, not scrap. Void-free surface: We use a proprietary casting process so each bell can reach the highest quality and have the cleanest finish possible. This also allows us to have a smooth, comfortable handle. Single Piece Casting: The Xtreme High-End Kettlebell is cast in one solid piece, creating a stronger, more reliable handle and a void-free surface - no plastic caps, plugs, or patches like lower quality products. Finish: The Xtreme High-End Kettlebell has a matte black powder coat finish that has a great feel and will hold chalk. This feels more natural than a thick epoxy finish. Colours: We colour coded the handles. By associating each kettlebell weight increment with a different colour handle, it becomes much easier for gym owners and trainers to direct athletes to specific kettlebells on sight alone.